1. "Use of capability" - Haddock argues that Vietnam, the Cold War, the Gulf War and the recent Balkans War are examples which are not applicable to the RAAF. Nothing could be further from the truth. In all of these diverse scenarios tacjammers provided a decisive advantage allowing strikes to proceed in situations where losses would otherwise be prohibitive. Small air forces like the RAAF cannot afford attrition and any supporting assets which can achieve this effect are essential. 2. "India and the PRC as potential threats" - Haddock argues that the RAAF is unable to attack the PRC and Indian mainland for reasons of range, and that should Australia become embroiled in a fight with either, we would have to rely almost completely upon US combat forces. This "counter-argument" wholly misrepresents my arguments in relation to the PRC and India, published in AA and API over the last two years. Indeed it is an attempt at a "reductio ad absurdum" disproof, assuming the reader is unfamiliar with my previously published arguments. The scenario of the RAAF launching strikes against India or the PRC in the event of a dispute is improbable, simply due to the potential for a nuclear counterforce strike by either. However, with tanker support and basing in South East Asia, the F-111 does have the combat radius performance to attack targets in the PRC or India. The tankers can stand off and refuel their own F/A-18 escorts. The scenario we should be more concerned with, which I have argued in the past, is that with increasing strategic competition between the PRC and India (evidenced by India's recent nuclear tests explicitly declared to be retaliation to the PRC for the extension of runways and basing facilities in Tibet) there is significant potential for either the PRC or India to seek control of South East Asia, or parts thereof. Why ? The PRC is developing an increasing level of dependency upon Persian Gulf oil, and the most efficient route to deliver that oil is through the straits in SEA. Therefore in an escalated confrontation between India and the PRC, it is in India's interests to restrict the PRC's supply of fuel by blocking SEA as an access route. Conversely, it is in the PRC's best interests to pre-empt such a move by deploying a forward based force into SEA. The PRC's growing involvement with the regime in Myanmar (Burma), eg basing rights for naval vessels, could be interpreted as a first step in positioning the PRC to conduct such an operation should the need be seen to arise. It is not in Australia's strategic interests to see either the PRC or India become established in South East Asia, since this provides either with basing which is within striking range of our mainland, and also allows either to throttle or cut our shipping lanes to the North. Importantly, neither the PRC nor India have the logistical capability nor the strategic position to deploy everything they have into SEA. Therefore any contingent they deploy into the region would be limited in size to one or two regiments of fighter aircraft, and several battalions of supporting SAMs, radar and AAA. A force package of this size is something the RAAF could tackle, and by developing the capability to decisively defeat such a force package, the ADF can in effect block a move into SEA by either the PRC or India. Indeed this is a basic deterrent strategy which can stabilise the region, by making the cost of an incursion by either player into SEA quite prohibitive in potential losses of aircraft and supporting assets. Perhaps Haddock can explain why India is investing heavily in carriers, and the PRC investing heavily in anti-shipping missiles, and 350+ Su-27/30 aircraft, and both shopping for tankers and AEW&C ? These are the reasons why I favour using the counter-air capabilities of the PRC and India as a benchmark for setting capabilities. It is prudent given the developing strategic situation in the region. 3. "Supporting the RAN" - Haddock argues that the F-111 has neither the range nor the loiter capability to support RAN surface assets in blue water operations. Again this counter argument is flawed. Firstly, of all fast jet aircraft in service today, the F-111 has the best loiter performance by far, by virtue of its swing wing. At 26 degrees of sweep it can loiter at a very modest 285 KTAS, and achieve very good time on station at several hundred miles of radius. Moreover, with inflight refuelling (and the RAAF has stated its intent to beef up the tanker fleet, and acquire a boom capability), this allows a substantial extension of time on station. Operating in SEA littoral waters and within the Air-Sea Gap, RAN SAGs would fall under the coverage of JORN surveillance which provides ample warning time to sortie an EF-111 from a land base in the region, to support an impending engagement with a hostile SAG, or outbound bomber strike force. So the choice exists to sortie the aircraft reactively, or pre-emptively and refuel them in flight to maintain loitering coverage while the SAG penetrates into a defended or contested area. WGCDR Michael Maher recently published a paper (APSC WP75) which specifically argues a maritime strike doctrine based upon aircraft sortiing from SEA bases, Cocos and Christmas Island. The CONOPS I proposed is mostly consistent with Maher's arguments, and developed quite independently. Haddock's argument that a helo is a better platform for such a capability overlooks two vital factors. The first is that the footprint of a helo at 10 kft cannot compare with the footprint of an EF-111 at 25 kft. The second is that the helo is a sitting duck for a fighter or long range SAM shot - both of which the EF-111 is capable of evading by speed/persistence. 4. "Collins comparison" - Haddock argues the comparison is unrealistic. Assuming the Collins SSK eventually becomes combat capable, it will provide no capability to screen a RAN SAG from ASM attack, and a very limited capability to support a SAG vs SAG engagement, due to its slow transit and dash speed. F-111 Harpoon/SOW shooters can deliver a much greater weight of fire upon a hostile SAG than one or more SSKs can, do so much quicker , and reload and restrike much quicker as well. 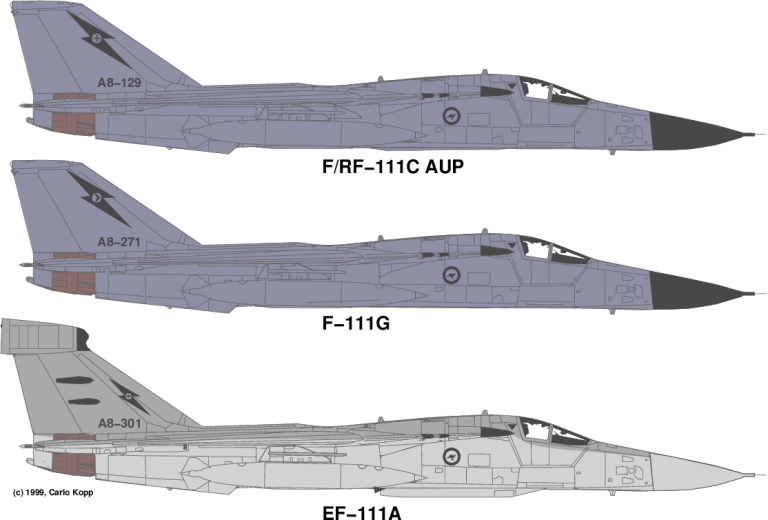 The EF-111A provides the F-111 with the ability to bypass forward pickets and attack the high value assets in the core of an extended SAG. There is no substitute for jamming the search radars blind in a massed Harpoon/SOW attack. 5. "Number required" - Haddock argues that 8 EF-111As is an inadequate number for the RAAF. I must also question this counter-argument. Firstly, recent Green Flag experience indicates that the digital avionic package in the F-111C AUP and F-111G provides exceptional uptime, and the basic avionics in the AMP EF-111A are similar to the F-111G. The second point is that the EF-111 need not be loaded up with all ten jammer modules, these being the most maintenance intensive portion of the ALQ-99E. The aircraft can be quite effective with only 4-6 jamming modules, indeed how often does an EA-6B Prowler sortie with more than 2-3 pods (4-6 jamming modules) ? 6.Finally Haddock argues that commercial airframes fitted with jam pods will do for training purposes. Perhaps, but they provide no combat capability, and thus amount to a single purpose asset. The EF-111A can perform both combat and training roles, and perform the latter with much more realism for the victim operators. A last point to make in favour of the EF-111A, omitted for reasons of brevity in the original piece, is that such aircraft would allow the ADF to make a valuable contribution to UN/Coalition operations without the political impediments of being seen to be dropping bombs on people. Overall I can see no reasons why not to deploy the EF-111A, and many reasons why it should be done. Maritime strike warfare and counter-air operations are vital to our defence, and the EF-111A is an extremely useful asset in both areas. While the RAAF may eventually have the choice of replacing the F/A-18 and F-111 with stealthy F-22/JSF, no such options exist for RAN surface assets. Defending them from bombers and ASMs will become an increasingly important requirement.